Sleek, minimalistic design makes this Trinsic Single-Handle Pull-Down Sprayer Kitchen Faucet in Chrome featuring MagnaTite Docking the perfect complement to today's modern home. MagnaTite docking keeps the kitchen pull-down spray wand firmly in place with a powerful integrated magnet, so it stays docked when not in use. Delta's exclusive DIAMOND Seal Technology uses a valve with a tough diamond coating to bring you a faucet built to last up to five million uses. Delta Innoflex PEX supply lines are included with DIAMOND Seal faucets, so everything you need is in one box. Trinsic Single-Handle Pull-Down Sprayer Kitchen Faucet with MagnaTite Docking in Chrome Sleek, minimalistic design makes this Trinsic Single-Handle Pull-Down Sprayer Kitchen Faucet in Chrome featuring MagnaTite Docking the perfect complement to today's modern home. MagnaTite docking keeps the kitchen pull-down spray wand firmly in place with a powerful integrated magnet, so it stays docked when not in use. Delta's exclusive DIAMOND Seal Technology uses a valve with a tough diamond coating to bring you a faucet built to last up to five million uses. Delta Innoflex PEX supply lines are included with DIAMOND Seal faucets, so everything you need is in one box. 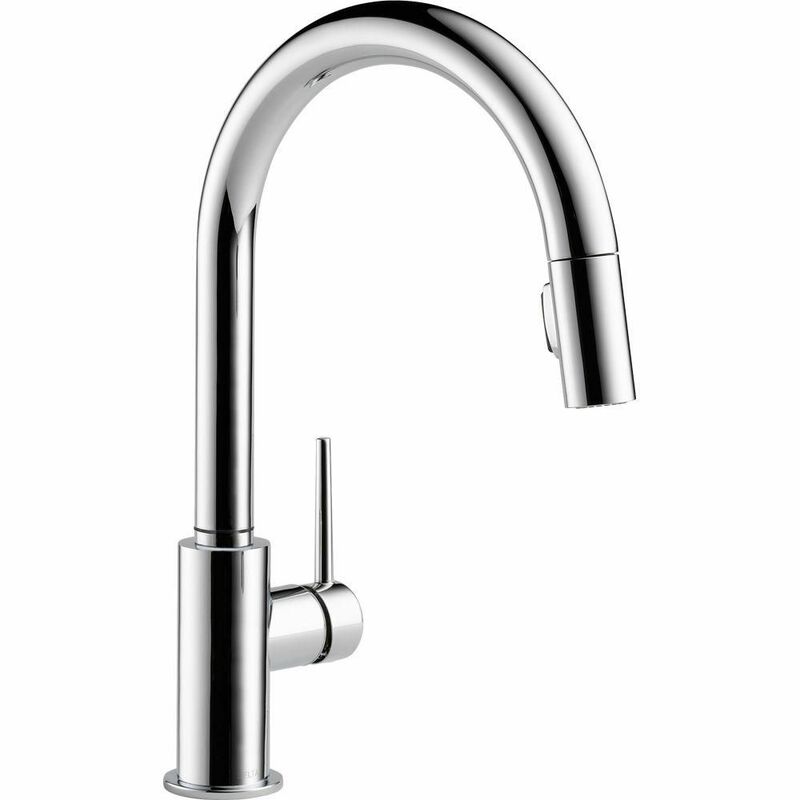 Trinsic Pull Down Kitchen Faucet in Chrome is rated 4.4 out of 5 by 170. Rated 4 out of 5 by Brighter from Interesting how Homedepot.com won't allow updating a previous review, so here is a new one: Over... Interesting how Homedepot.com won't allow updating a previous review, so here is a new one: Overall, this is an excellent faucet and I had no problem installing it AFTER ordering two additional parts: 1. a RP64070AR Escutcheon Plate because a "deck plate" was missing from the box, despite being described as "included" in the Product Overview. (See photos with this review.) Ironically, Home Depot doesn't sell the RP64070AR, so I had to order it from a competitor. 2. a RP37490 stabilization plate because my kitchen sink is stainless steel Finally, Home Depot links an incorrect installation guide on the page for the 9159-AR-DST. The correct installation guide can be found at https://media.deltafaucet.com/MandI/92728%20Rev%20C.pdf and has a part number of 92728 Overall, very happy with the faucet, but very disappointed with Home Depot's indifference about making sure the details for a product sold online at homedepot.com matches what this customer actually received.